There is a magical land, turned towards the sea and ocean, lying in front of the long chain of Atlas. There is no street view. 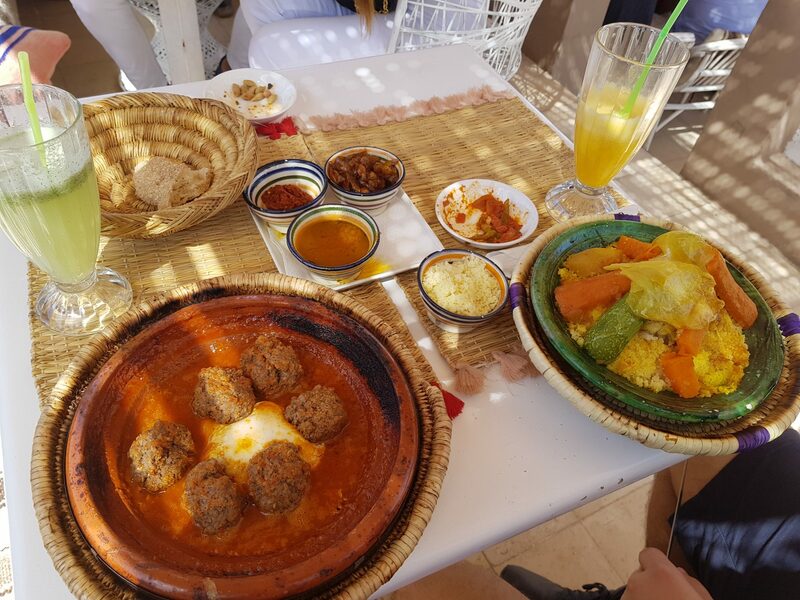 A young couple from Belgrade finally decided to indulge and flew to Morocco. 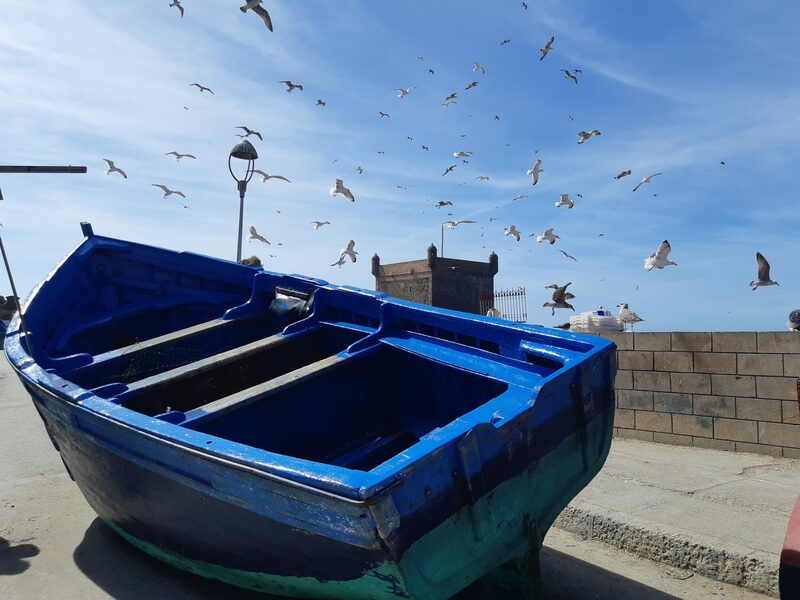 They wanted to spontaneously discover the endless streets of medinas, human colorfulness, as well as the unusual colors and scents of Morocco. They weren’t craving a crazy adventure, but neither a comfortable agency organization. 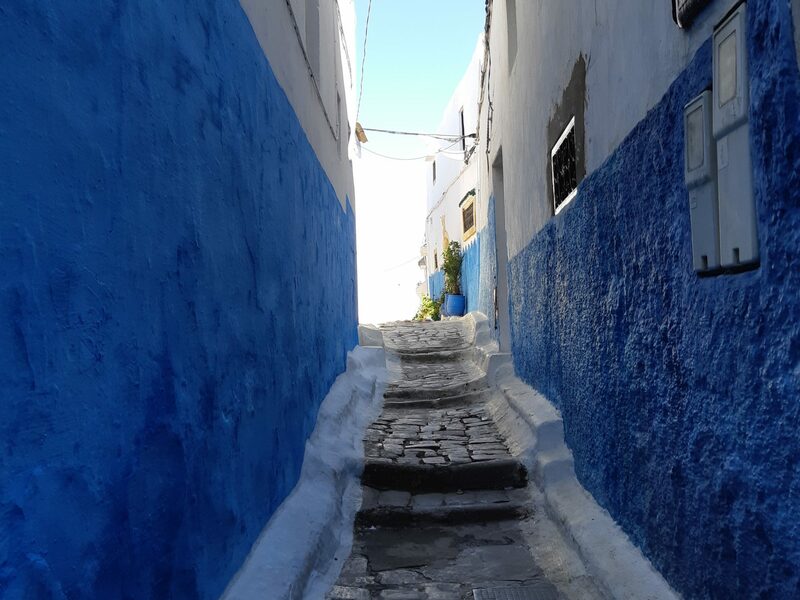 Even if it meant skipping on one of the must see monuments, that wasn’t so important as it was a walk in the rain through the mysterious and narrow passageways of some medina, or a long sit on the beach of the ocean. 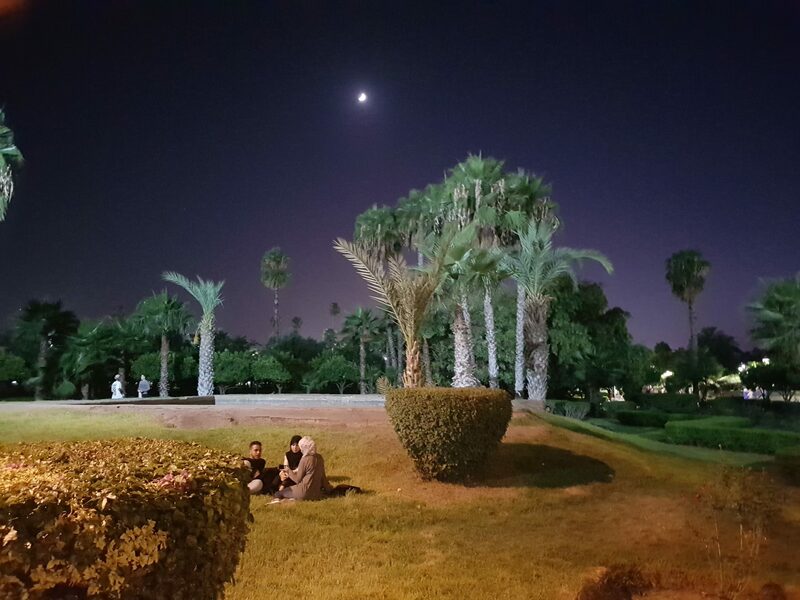 They started their travel in Marrakech, continued to Rabat, Fes, Essaouira, in order to end it in Marrakech again. We copied a couple interesting facts from that trip, but also got some gorgeous photographs. They looked for, and found accommodation in traditional riads, not in classic hotels. 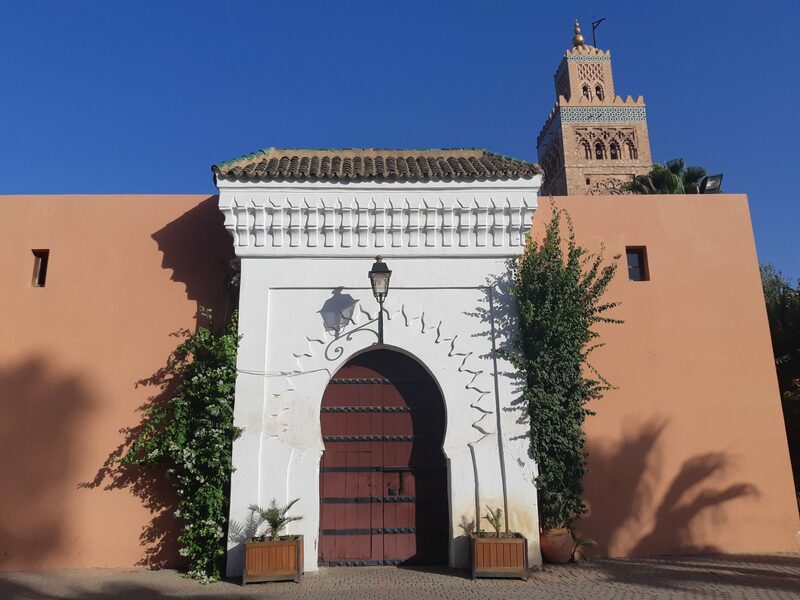 Riads are buildings found, usually, in medinas, surrounded by high walls, almost without any windows, and if there are any, they are small and with bars. Inside of such building lies a beautiful, hidden garden. 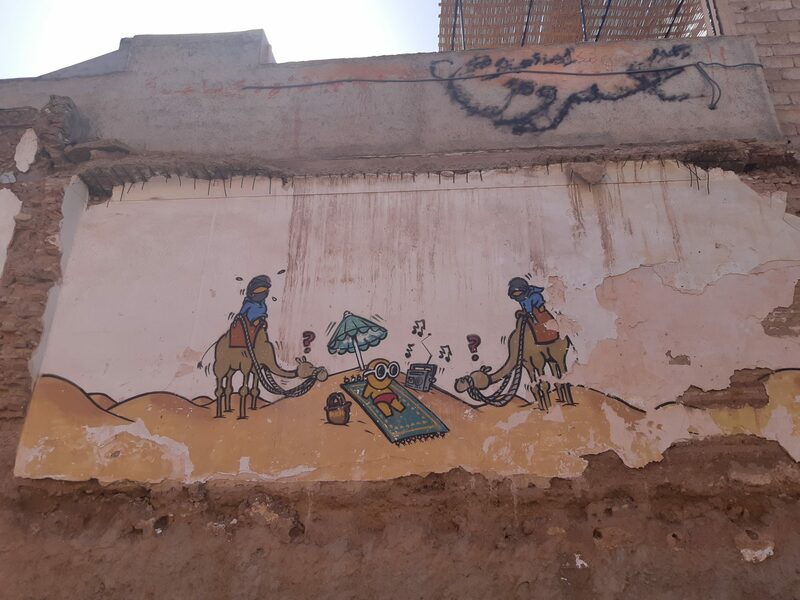 They got to their riads almost completely on their own; almost, because when the time came to turn right and reach their destination, they couldn’t manage. But “spontaneously” a young man, who knew where “their right” is, brought them there in exchange for a small tip. Passageways inside medinas are unusual, even when they resemble someone’s backyard, they are still a regular walking path. 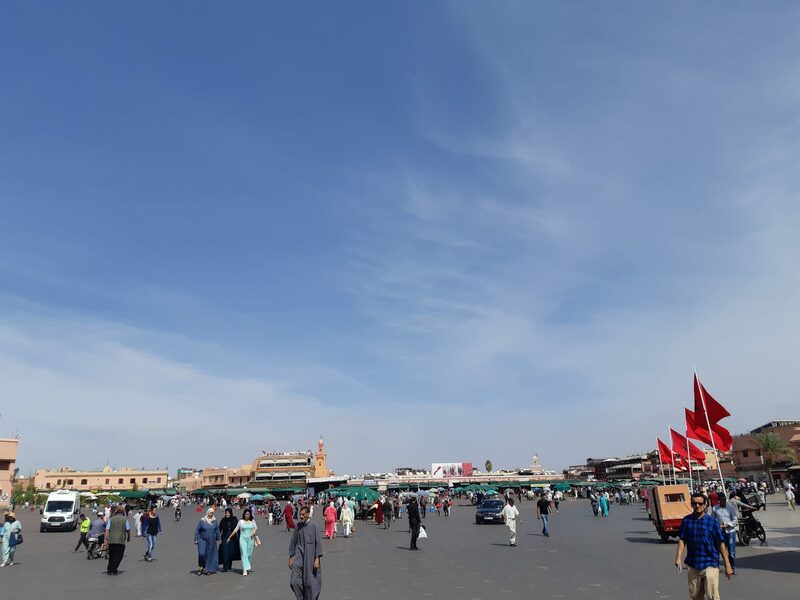 They started the next day early at the biggest square in Africa, Djamâa el Fna, and the main square of Marrakech. The square is a vast space, almost unreal, but still, a bunch of cars, mopeds, streetwalkers, or carts pulled by donkeys manage to find their way without any struggle. On the other hand, almost all cars have dents in them, from persistent passing by other vehicles in narrow streets. At night it’s filled with people, traditional music is playing, amongst them even cobra dance musicians. They claim that scene was horrific because the poor snakes are sedated actually, they lie on the carpet until you look at them, which is when the musician starts playing, but the cobra doesn’t move like in cartoons. Also their teeth are removed. A sad sight; they claimed to have learned to hold a poker facein order to avoid being part of such shows. 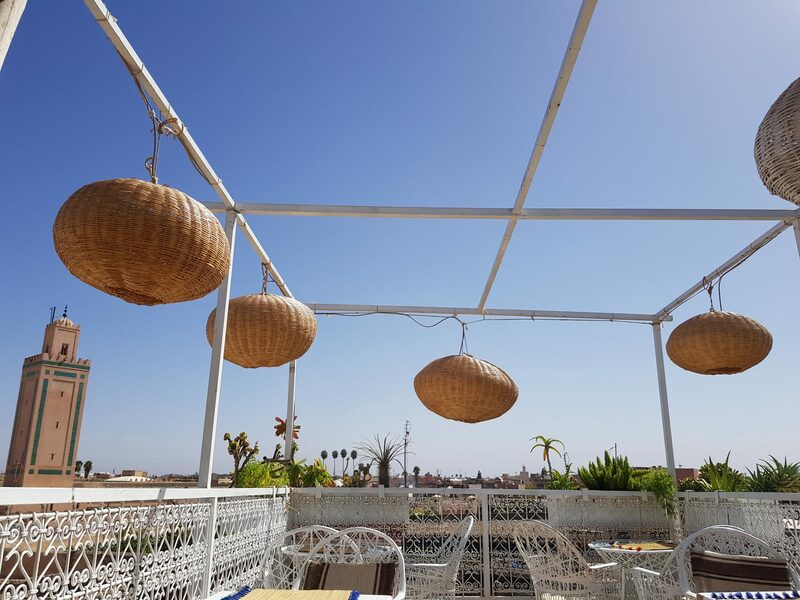 While sitting at a café, a young Moroccan musician approached them with a kind of tambourine and started playing their popular song which they recognized because a long time ago, Zdravko Čolić, sang it as “strong, strong heart…’. Plagiarism or not, it didn’t matter to them. They fell in love with “real” orange juice, but the tastiest was still a pomegranate juice. If you drink out of a glass cup it will be cheaper, but if you want your own plastic one, because you fear stomachaches, you will pay more. Besides, even with all the probiotics and precaution measures, stomachaches are almost inevitable. 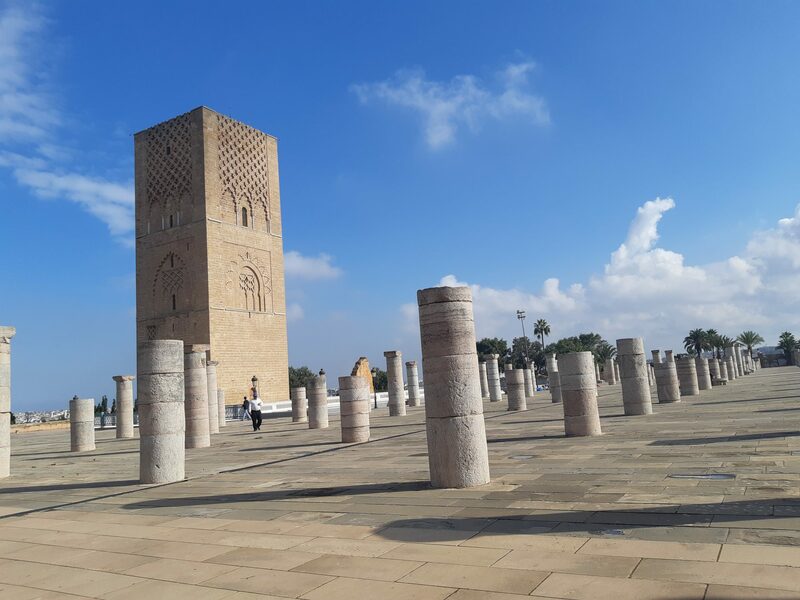 The biggest mosque in the city is famous Koutoubia from the 12thcentury, in who’s image were later built those in Rabat (Hassan tower), but also in Spain, in Seville (Giralda). They would often wake with the Muslim priest’s first song. Afterwards, a walk through the palace and history throught the mixed beauty of a vasir’s harem and the skills of a Grenadian master and Arabic ornaments on ceramics. 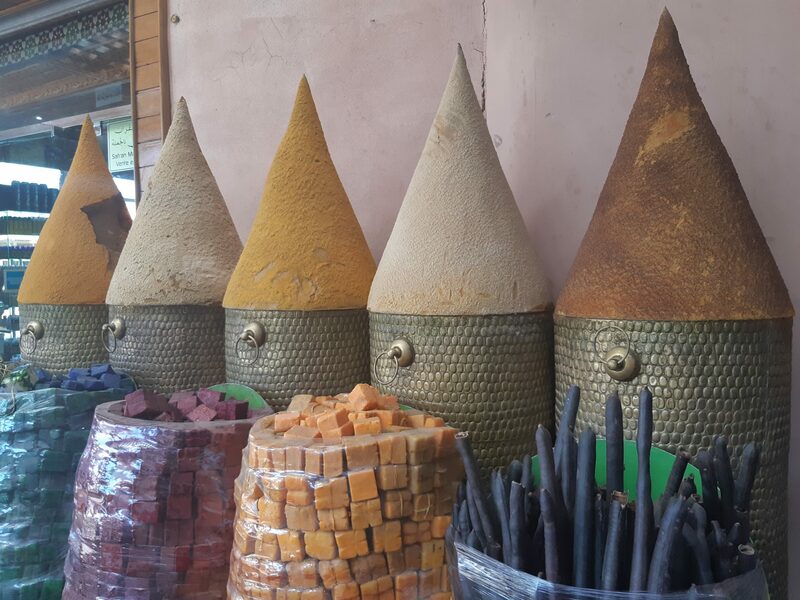 The Marrakech medina is filled with stores; many items are both made and sold in the open. A car oil salesman (presumably) calmly douses the greasy street in front of his shop with water, while right next to it people shop for fresh meat. They didn’t talk much about smells of intestines and fish, their grimaces said it all. That’s why, many alley cats live royally, everyone feeds and pets them and no one is doing any harm to them. As they say: if God created them, they will surely have something to survive of… they didn’t notice pets in the way that we keep them. They sell spices, teas, colorful carpets (sad they haven’t bought one), hand decorated metal lamps and chandeliers, soaps and strong and opulent floral perfumes. Their sales skills perfected making some haggling inevitable. There are some stores with fixed prices in order to attract tourists annoyed with haggling, but you guessed it right, you still end up haggling. Every single one of your actions provokes a reaction, whether by talking or by making offers; they ask questions on where you’re from, even draw out a flag or a may throw a couple of words in your language. One salesman still managed to win them over: “… come in my friend, I’m coming from the mountains, I’m here only today…” and of course, they entered. Berbers from the mountains are in fact different. Besides for creams, argan oil, soaps and spices, he offered eucalyptus crystals. This usually isn’t offered to tourists unless they ask for it themselves. He asked for 10 dirhams, he gave them for three. 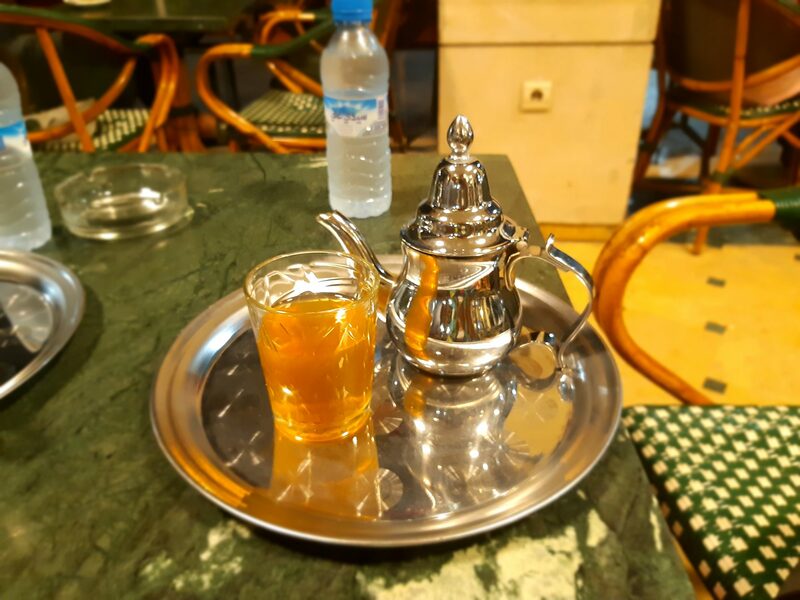 They learned how to put it in tea by an old man who walked in the store carrying hot tea, saying, “look, look, this is traditional Berbers hospitality…”. He put “magical” rosewater and clay cream on her hand and magically the skin turned white. Of course, he just revealed her the “the secret of Berber women’s beauty”. “Sleek, yet sweet”. When they returned to Marrakesh a couple of days later they dropped by to see him. He quizzed them around his store, “what is this, what is this, but they proudly answered all his questions. 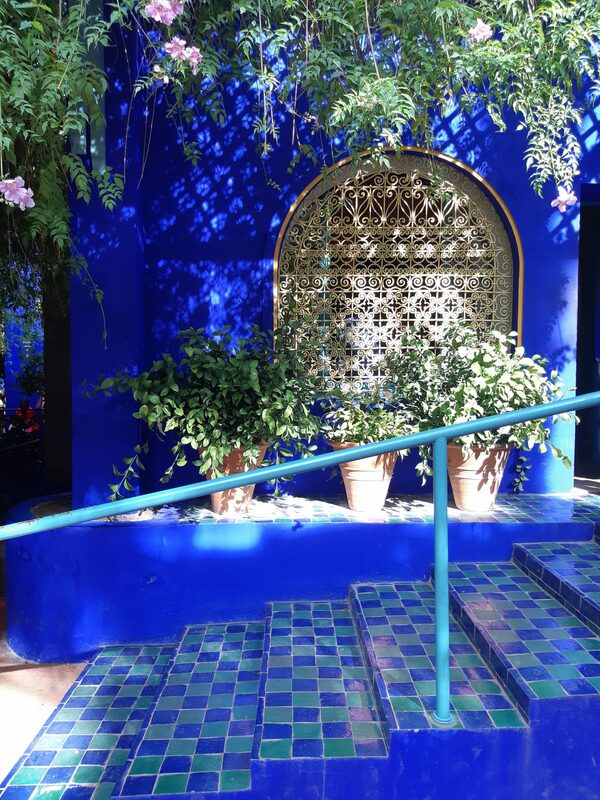 Marrakesh is full of parks and gardens, but in one, magically blue and unique, they especially enjoyed – Jardin Majorelle. 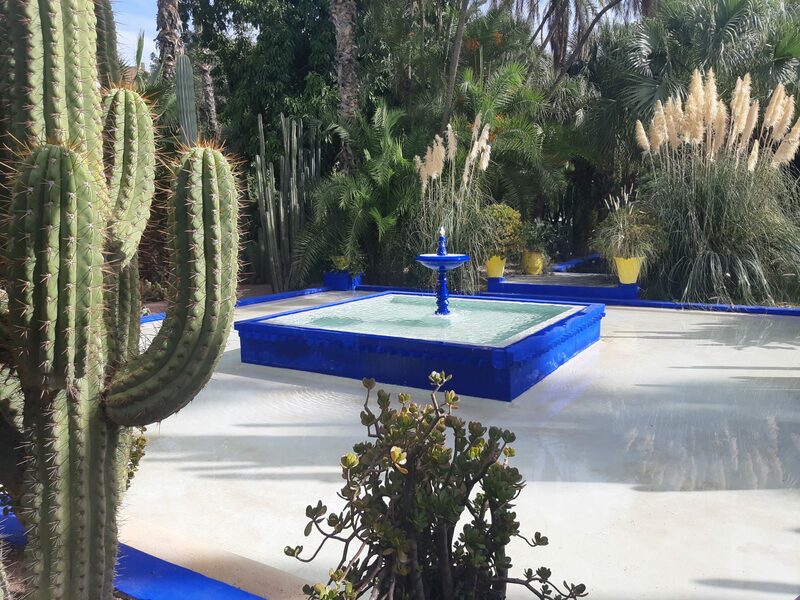 The French painter Jacques Majorelle spent 40 years creating this jardinfull of vibrant plants, lotuses, and cactuses, wreathed in paths, a fountain and streams. Many bird species decided to adopt this beauty and make it their habitat. 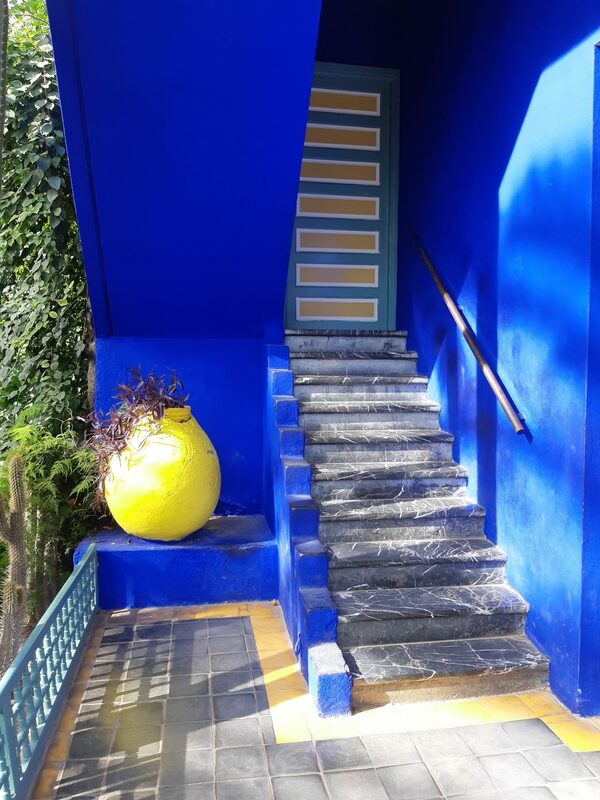 The intense blue color of the villa or fountain is called Majorelle blue; the painter was inspired by the blue of Moroccan ceramics, tiles and Berber clothing. Nevertheless, bloggers and travelers prefer visiting the museum of a sensitive French designer, Yves Saint Laurent, who restored the garden and at periods lived there. They say that his ashes and the ashes of his life partner were spread across their much loved jardin. 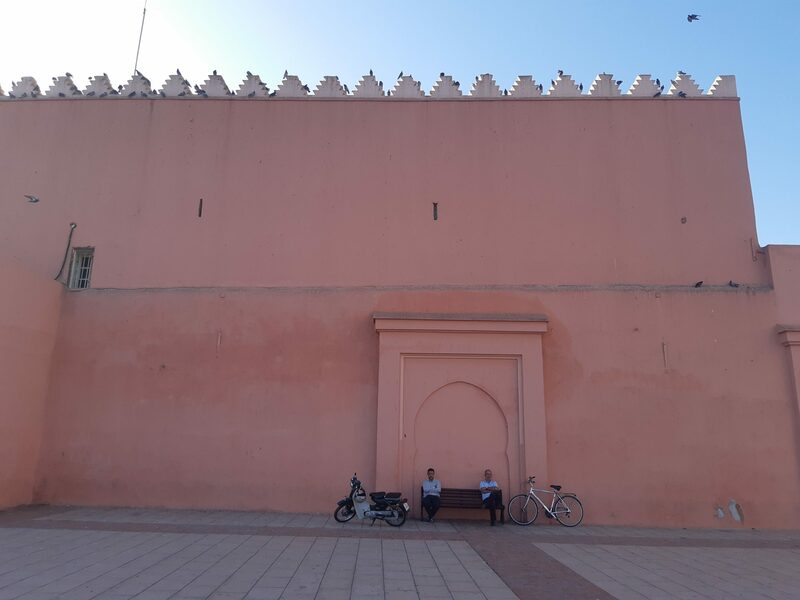 Marrakech is truly a special city, but as they say, if you place your trust only in Instagram pictures, you may be disappointed. Besides for its architectural gems in distinct reddish color, it is also dusty and dirty, expensive and packed out. But it enchants you again, not just with the old medina but also with modern-day buildings (not tall so that minarets are visible), boulevards and parks. Even though they tried many local dishes, they claim to have had enough of the smell and taste of curcuma. 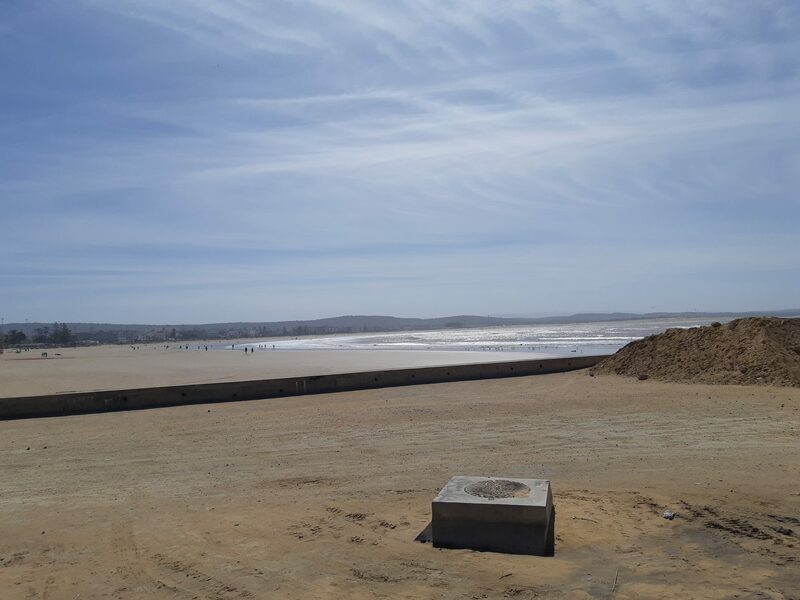 They continued their travels to the enchanting Esauira, once named as Mogador. A city surrounded by walls, the city of argan and blue, wooden ships of specific construction. The precious argan tree is rare and grows only in Morocco. 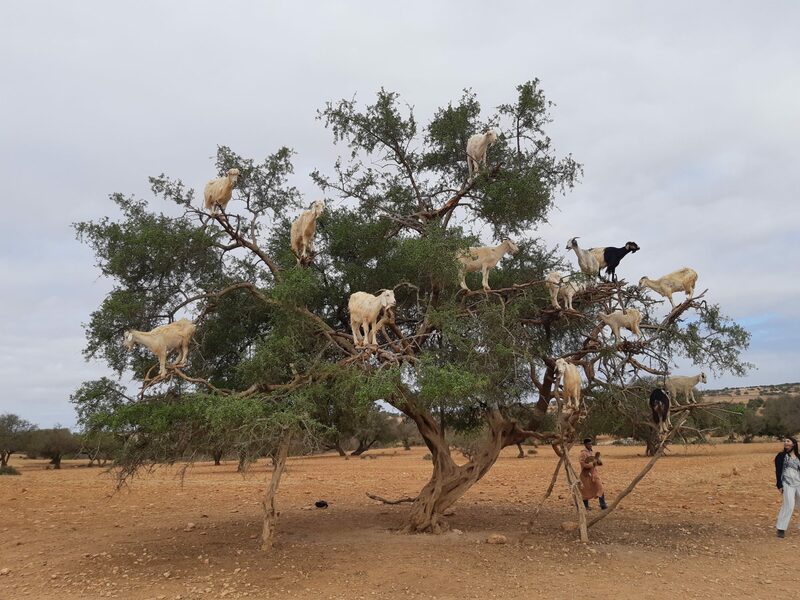 The ever so popular image of a dozen goats in the argan tree is “fake”. The poor animals are tied to branches so that tourists could take an “original” selfy. Goats do climb argan trees and eat their fruits, but they certainly don’t live on them. 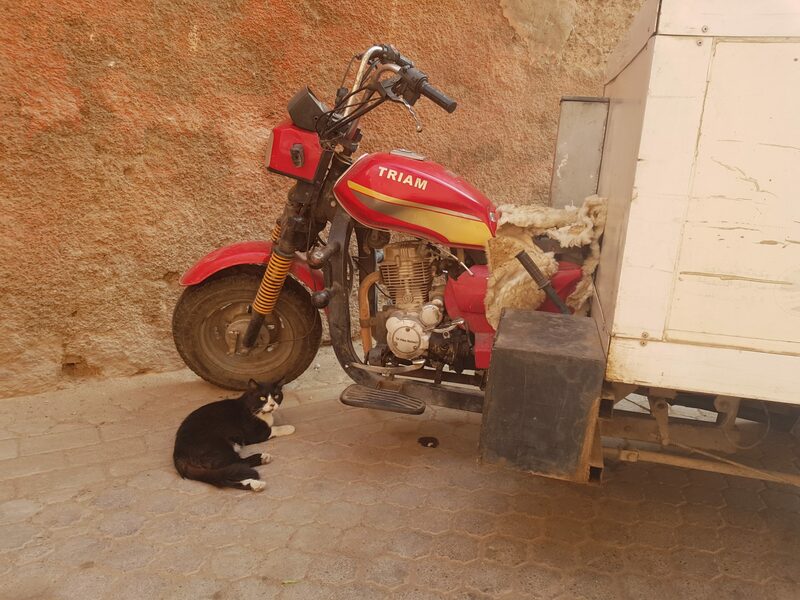 Trips from Marrakech to Esauira are frequent so the locals taught of a way to draw visitor’s attention and make some money of tourists who stop in order to take a picture. 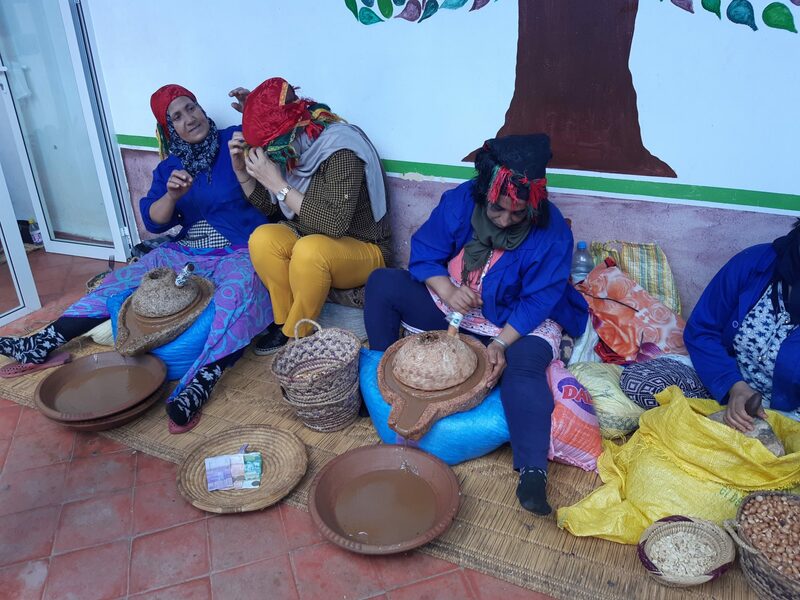 They had a chance to see how argan oil is made, although that presentation is only for tourists as well: women are sitting on the floor beating the fruit in order for the smaller fruit appear, which is then baked, then minced, thrown in the water, then pressed until oil starts showing up. The magical results of using argan oil on my hair and skin are expected one of these days. It’s not of some special smell, it’s thick, and the skin absorbs it immediately and is left incredibly soft. 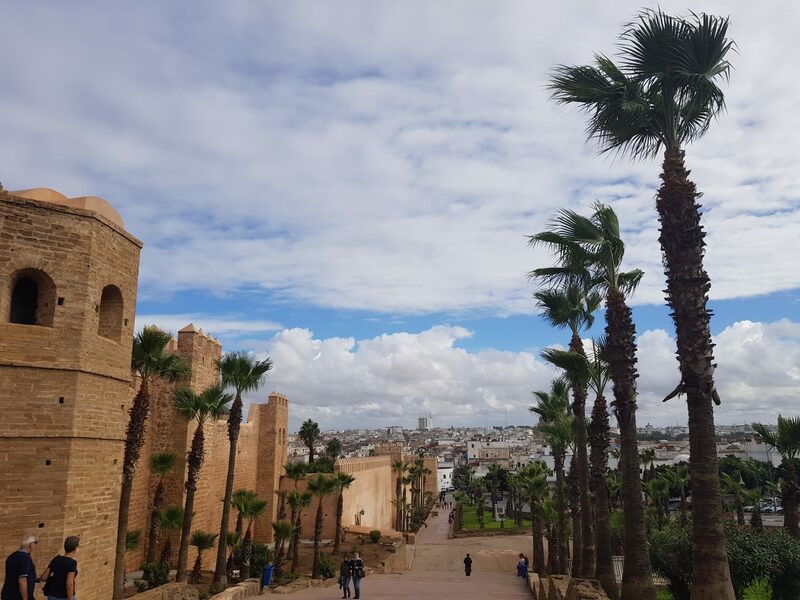 The next day they headed to Rabat, the capital of Morocco, which it became after the decision of French colonizers who moved it from Fes. 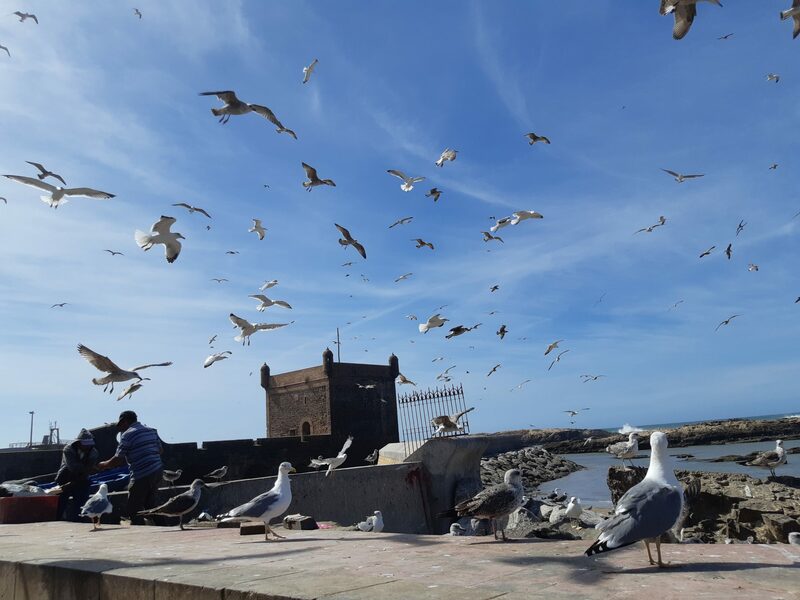 After the unforgettable crowds of Marrakech, Rabat had a calming effect on them. 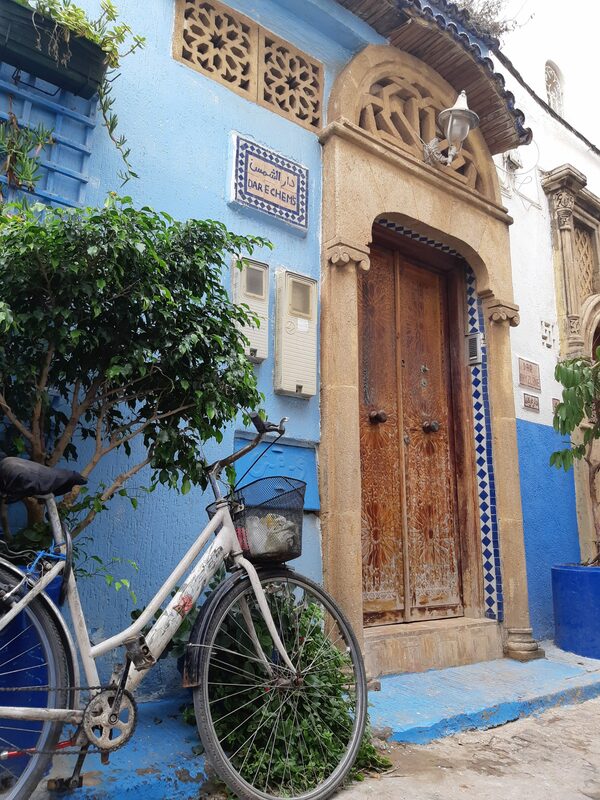 The accommodation in this riad was nicer than in the one in Marrakech, but the breakfast was just sweet, too sweet. The city calmly incorporates modern boulevards and a fancy marina with an ancient medina, Challah necropolis, remains from the roman times or Hassan’s tower. 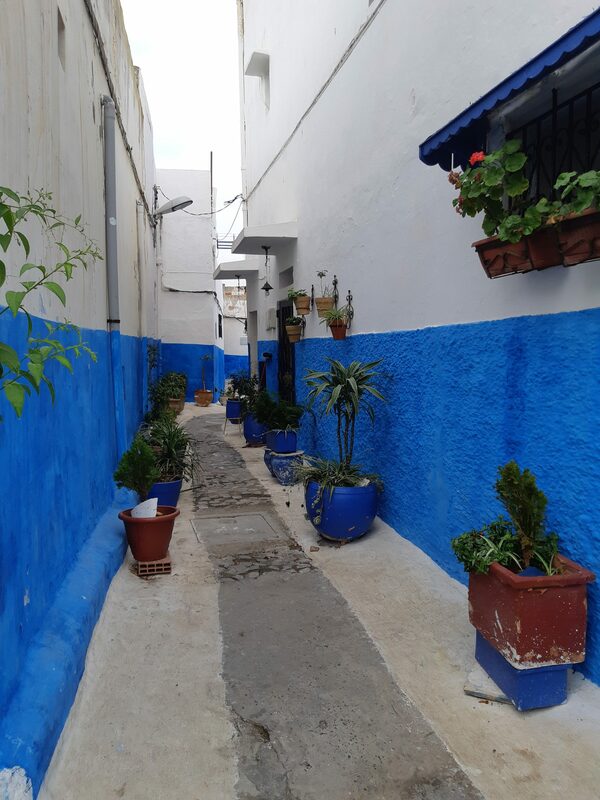 Kasbah Oudaia was “fantastic” because the houses in it were blue and white, a distinct Mediterranean style. 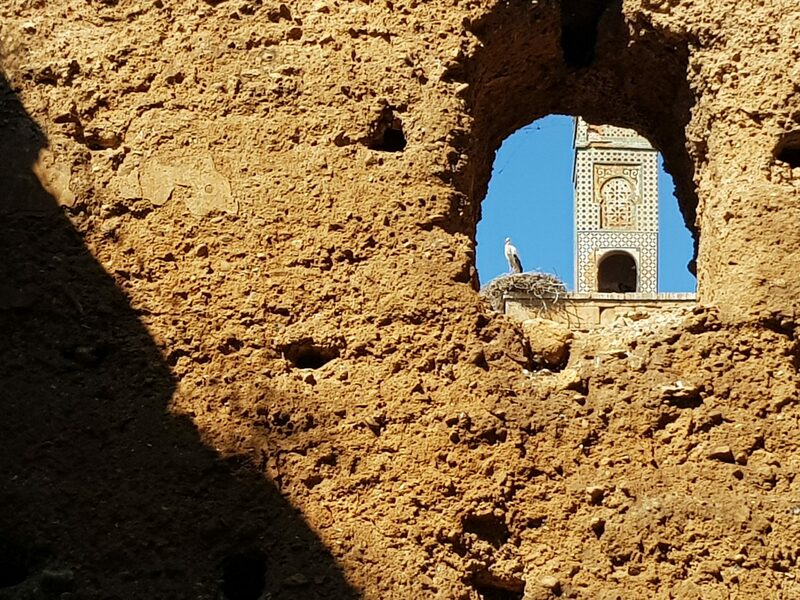 Kasbah is a part of UNESCO heritage, dates back to the 12thcentury; it was torn down, reconstructed, abandoned, but today stands tall in all its glory. They say that looking at those walls somehow reminded them of Belgrade’s fort Kalemegdan and the confluence (the river Bou Regreg flows into the Ocean there). The shore is rocky and sandy, but tame and waves stand as constant object in photographs and meditation. 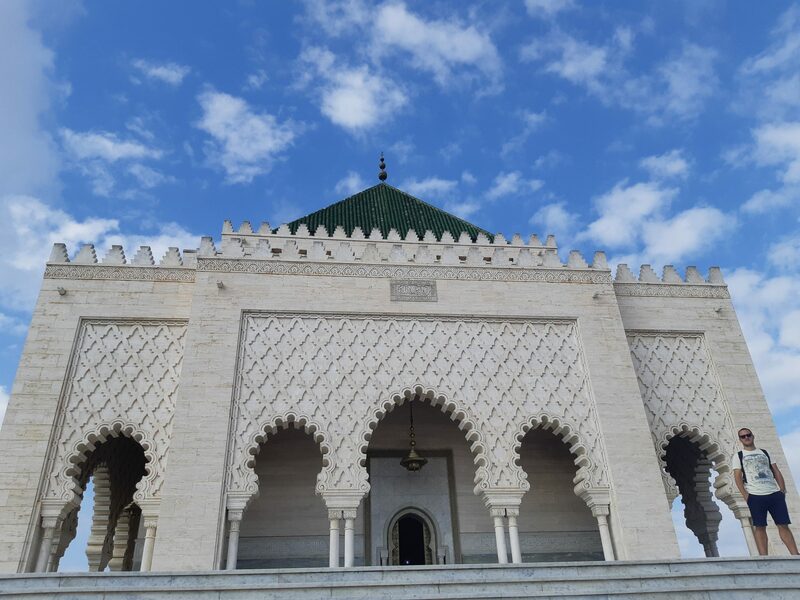 Rabat is unusually nicely spread between the ocean and the might mountain chain of the Atlas. People here are somehow attracted by the oceans horizon. A common sight here is people sitting in a car, with food and drinks and some pleasant company enjoying the view of the ocean. Fes, the former capital of Morocco is different from other cities. Rain was pouring the whole day, but they didn’t mind, especially because it wasn’t crowded. 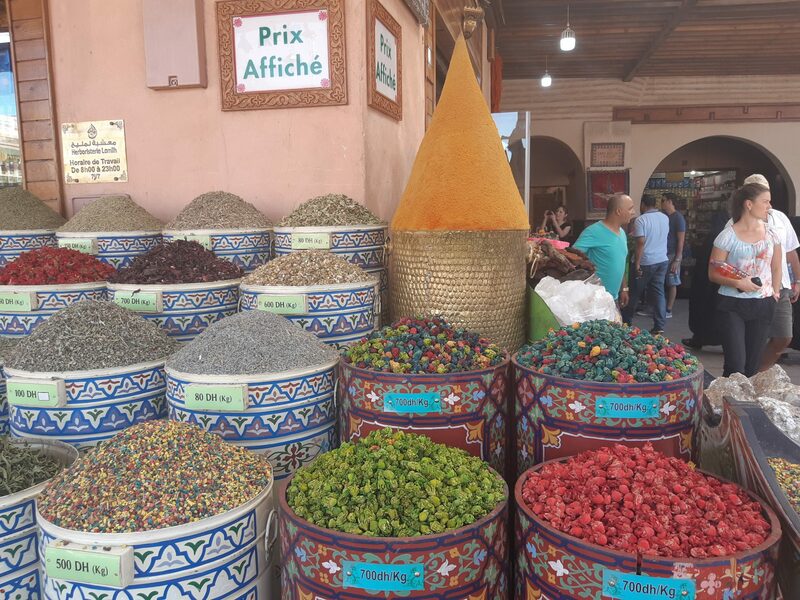 There they discovered perfumes in the shape of soap which holds its strong scent for days, and discovered mountain tea at third of the price in Marrakech. 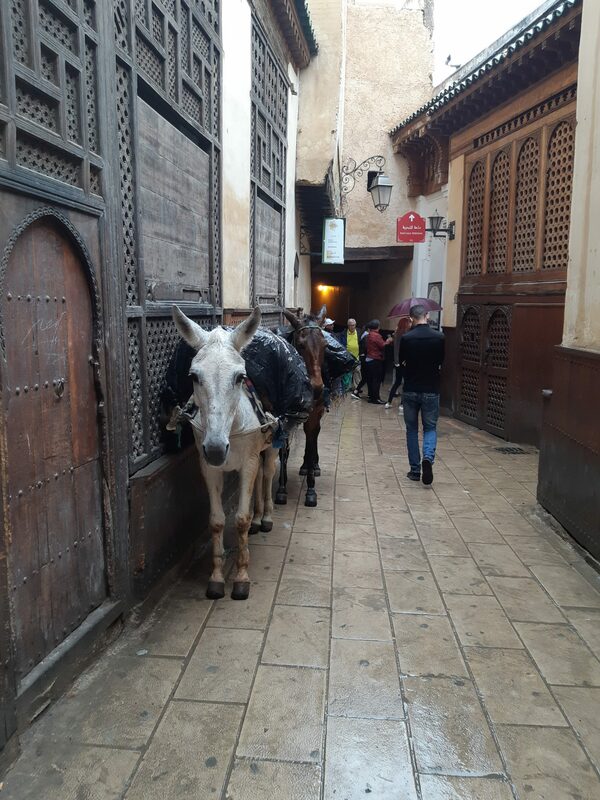 They wandered around even bigger medina and got lost in its narrow passageways with even greater ease. 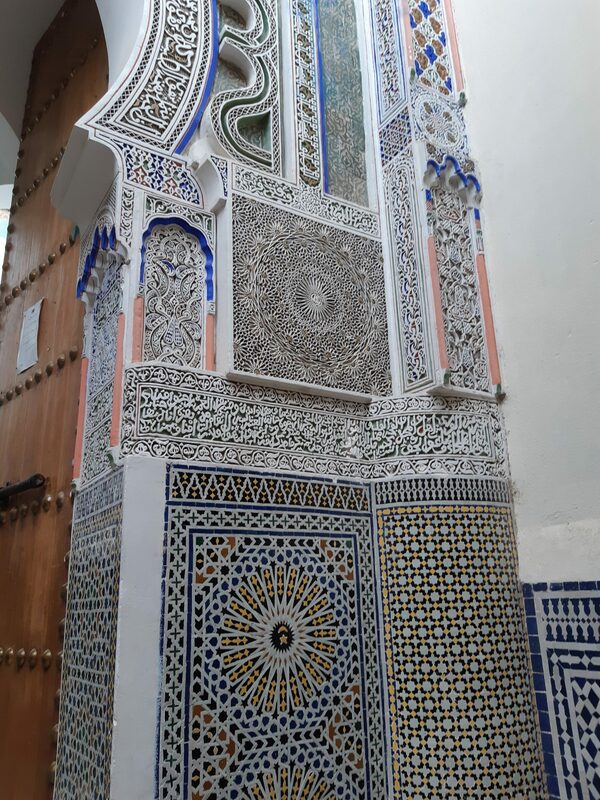 They would stumble across a beautiful mosque or “just” some fountain, decorated with tiles. They stumbled across yards which seamed abandoned, but as soon as they would take a peak inside, someone would yell “velkam” and invited them to climb some roof or terrace, usually of some shabby house. They were the best place from which there’s a view of the biggest tannery in the world. Of course, the view is not free, even when it’s not good enough. The tannery still operated in almost the same way as it did centuries ago. 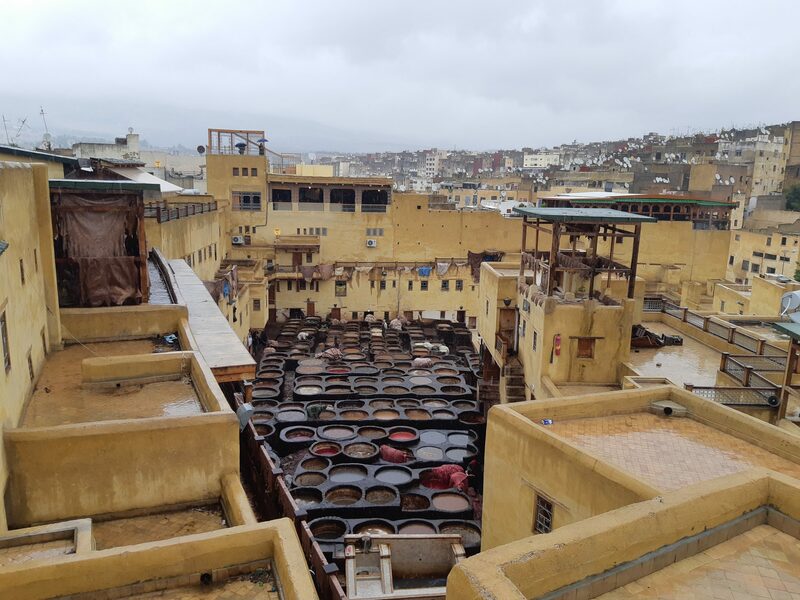 The biggest is Chouara tannery which looks surreal with round, yellow ponds in stone, but smells were unbearably real. That’s why fresh mint was sold for “under the nose”, in order to survive. The leather is exposed to ammoniac produced by pigeons leaving their natural loads. All of that is then dried and colored only in natural paint. They found some comfort in a beautiful blue gate of a madras, which is younger than the medina. 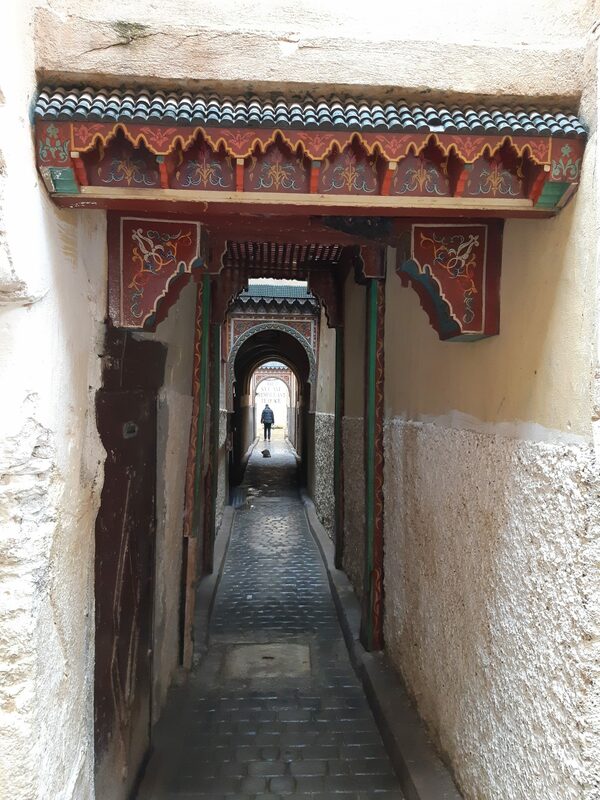 Fes is also home of Al Quaraouiyine, the oldest university in the world that never ceased working since 859; it was founded together with the madras and holds great value in Muslim religion. 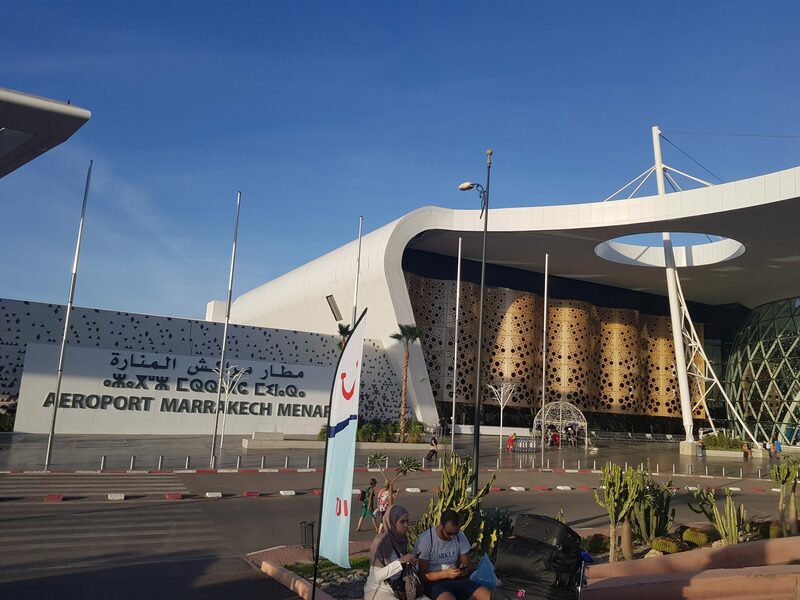 And then they returned to Marrakech, the starting and ending point of their small Moroccan tour. 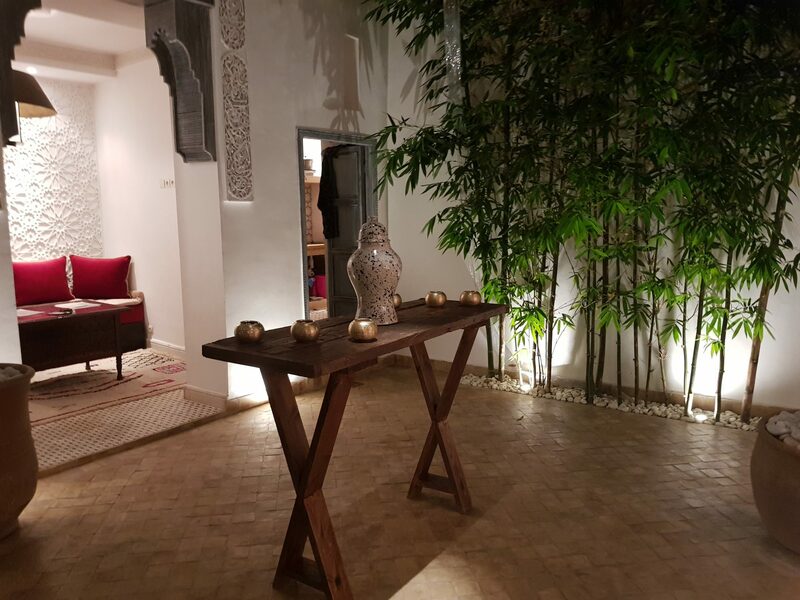 For hours I enjoyed their excited stories, as they showed me pictures and served Moroccan tea poured from a ewer from high above and added eucalyptus crystals in glasses. I am only retelling their impressions which will take some time to settle down. Morocco is a different dimension after all.